Group boards can play an integral part in the formula for generating massive traffic from Pinterest. In this post I’m going to share the common mistakes that bloggers and marketers make when joining group boards … and how to avoid them. 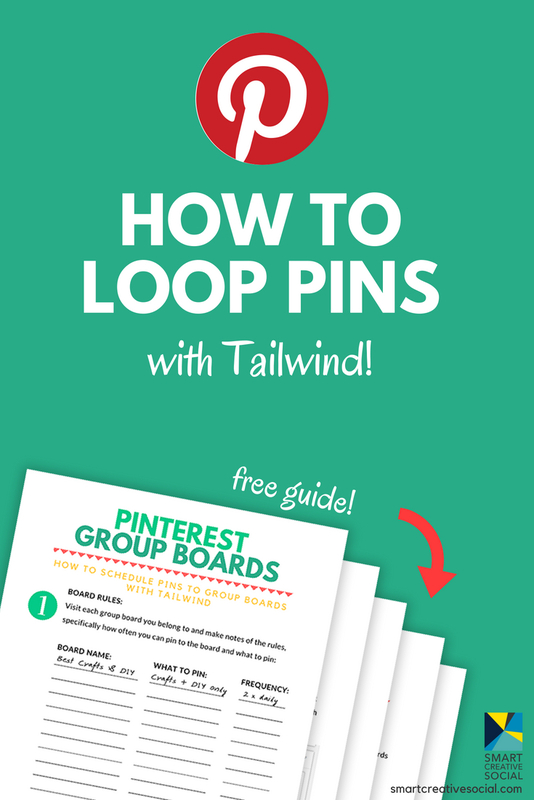 Plus, learn how to manage Pinterest group boards with Tailwind. 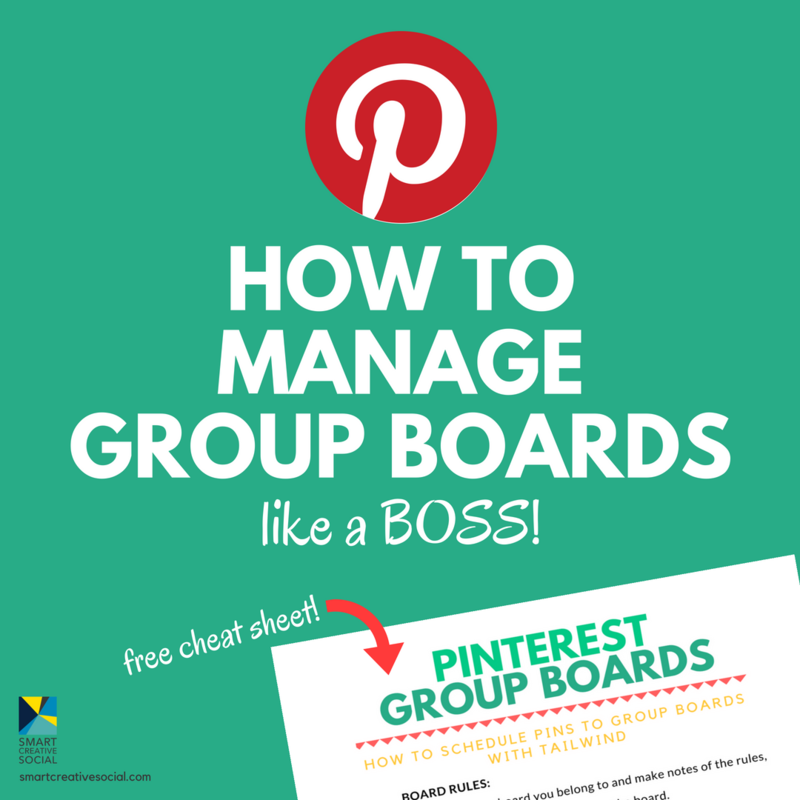 For many yers, group boards have been a foundational element in Pinterest strategy. Pinners would come together to add content to a group board based on a niche topic and everyone would see a boost in traffic as a result of this collective effort. I personally do not like leaning too heavily on group boards for traffic because you’re not in control of the board; the owner can remove your access to the board at any time. Group boards were always meant to be collaborative but not in the way that many bloggers have been using them to essentially “game the system”. As a result, Pinterest has expressed that group boards may experience diminished reach, affecting group boards’ ability to remain reliable traffic sources. However, when done well, group boards can still send quality traffic to your site. Group boards are set up by one person, who is the group board admin. That person invites other people with Pinterest accounts to contribute pins to the board. Usually the admin sets up rules and guidelines to help make sure that the content shared to the group board is curated around a specific topic. These guidelines may include rules about how often contributors can share content to the group board. Usually the group board admin will put the guidelines in the group board description. Before we go any further, grab this FREE guide for managing group boards with Tailwind!! Why are group boards so hard to manage? I find group boards particularly challenging to manage because every single group board admin can make their own rules. There is no standard or format to follow. Every single board can have a different set of rules as far as what you can put onto it and how often you can pin. Not only are the rule formats all over the place, the group board admins can change those rules at any time. There’s no notification system set up where the group board admin can message everyone or alert everyone who is a contributor that there has now been a change to the guidelines. The rules can change without notice. It’s up to each group board member to check the rules regularly. It is super easy to break the rules for group boards. Group board admins set up rules to prevent abuses and to make sure that the content on the group board provides a great discovery experience for pinners. It absolutely makes sense that group board admins would have rules. But because the rules can vary so much and the rules can change at any moment without notice, it’s very tricky and challenging to make sure that the content you’re pinning is following the rules for every single group board. Essentially you would need to check the rules for every group board at the moment that you are pinning content to the board. This is simply not practical if you’re pinning directly on Pinterest because it would be very time-consuming. And it’s nearly impossible if you’re scheduling content because you can schedule the content and be following the rules today, but when that content publishes next week, the group board admin could have changed the rules. Why is group board management an issue? I created this post to share some of the ways that I manage the group board problem so that I can still benefit from being on group boards. Want to manage all of your Pinterest boards in just a few minutes each week? You gotta get this! One of the reasons that I really dislike using group boards as part of a Pinterest strategy is because they have so many rules. Far too many times, I have been kicked off of group boards because I can’t keep track of all of the rules. Some boards don’t allow affiliate content. Some boards don’t allow you to link to other social media accounts, like this. And some group boards have rules about what you can pin on certain days of the week. I even tried creating a spreadsheet to track all the rules. But group board rules change without notice. I could have written down the rules yesterday, put them in my spreadsheet, and developed a whole strategy around that board only to have the group board admin change the rules today. And then I don’t even know that I’m out of compliance because there’s no notice of the change. One of the biggest pitfalls that happens with group boards is not following the group board rules because you’re not aware of a change. I wish that there was a better system for updating rules and keeping all of the contributors to the board updated on the rules but there isn’t. And because of that, some users tend to have fewer group boards because it’s just too hard to check the rules on any more than 5 to 10 group boards at a given time. You won’t get the maximum benefit from using group boards if you are using only a handful of them. That said, I still use group boards and if you are reading this, I bet you’re still using them too. There has to be a better way to manage them, right? I share how in this guide! You’ve probably heard bloggers talk about how amazing their traffic is because of group boards. Or maybe you heard them talk about how they’re getting incredible results by using group boards as part of their Pinterest strategy. But there’s a lot more to it than just plunking your content down on a group board. You need to make sure that you’re pinning your optimized content to group boards that are healthy, active, and niche specific. There are many factors to consider when trying to identify which group boards are going to benefit your business and which ones might not. One of the tools that I recommend using to identify group boards to leave and identify group boards that should remain an essential part of your Pinterest strategy is Tailwind. 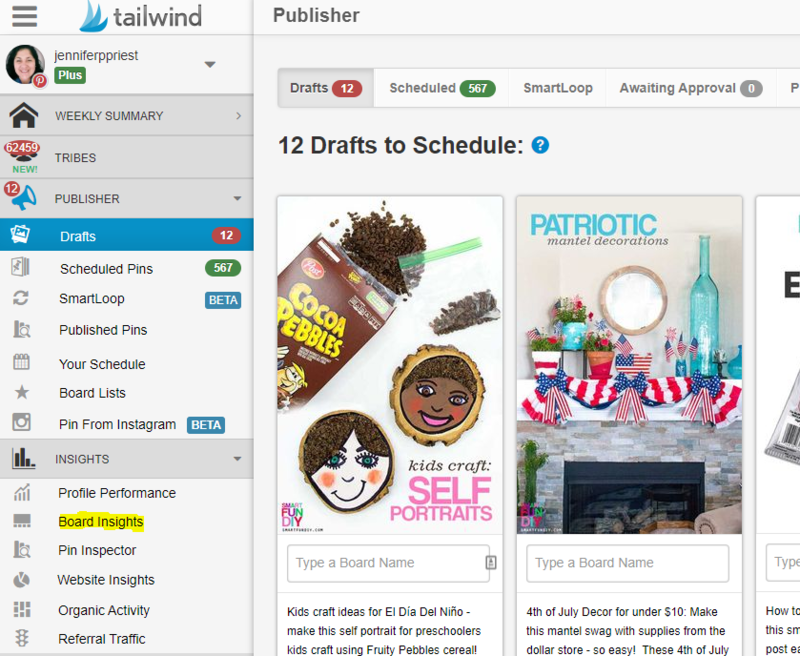 Tailwind has a Board Insights tool that you can use to see the virality, the repin rate, the number of pins on the board, and lots of other analytics data to help you with making informed decisions about which group boards should be an integral part of your Pinterest strategy. When are you ready for group boards? How can you tell when you’re ready to add group boards to your Pinterest strategy? When you join a group board you need to make sure that you’re going to be active and that means pinning to it regularly. If you don’t have at least 20 boards on your account that you are already pinning your own content to regularly, then you’re not going to be active enough on the group board to benefit the other pinners on the board. If you have 20 boards, that means you probably have about 100 pieces of content to pin to Pinterest (5 pieces of content per board x 20 boards). For a significant return on your time investment you need a good volume of content to contribute to the group board as well as your own boards. If you don’t yet have 20 boards of your own, your next step is to get those 20 boards up and start filling them with pins. Then you’ll be ready to start looking for group boards to add to your solid Pinterest strategy. Maybe the growth on your Pinterest account has started to slow or even flat-lined. Group boards are a great way to get your content in front of new people who aren’t following you. The way the group boards work is they show the content on the boards to the followers of everyone who’s contributing to the board. Everything pinned on the board is shown to all the followers of the board, whether they follow your individual account or not. Your content can get a lot more exposure to that niche audience if you’re on a healthy, niche specific group board. Adding a group board strategy to your current Pinterest strategy can be a way to boost traffic and impressions on your content. But first you need to make sure your content is optimized and is answering a need for your followers so it shows up in the following feed. 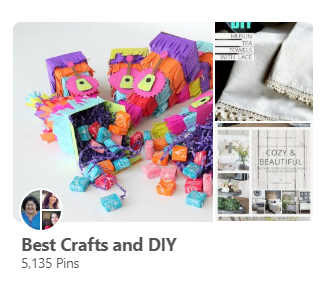 If you want to start sharing content from other pinners who are actively creating and sharing really amazing content on Pinterest, group boards can be a great place to find that content. Most group boards have a specific topic and the contributors are curating content on that topic. It’s a pretty good bet that if you want to join a group board because you have content that you want to pin to it, that you’ll find content from other people on that group board that matches your niche and that your audience would be interested in too. Pinning from the group boards you belong to is a great way to give back to the community and support the health of the group board. And it helps you add relevant content to your account that your followers will enjoy. When you start pinning more often per day, it’s easy to start to run out of places to put all of your pins. You have too much inventory and not enough shelf space for all those pins! I use the 5-and-5 rule for my boards: for every board, I must be able to pin 5 different pieces of my own content to it. And for every piece of content I make, I must be able to pin it to 5 different boards on my Pinterest account. That might sound like a lot of boards. But if you’re pinning every single day to Pinterest and you’re pinning multiple pins a day, you can easily start to run out of places to put all of those pins. Group boards are a great way to add more “shelves” to hold your pin “inventory”. There are lots of different places to find group boards but here is a list of just a few ways to find group boards in your niche. PinGroupie is an online directory where group board owners can submit their group board to be included in an online listing. You can search PinGroupie to find group boards to join. It’s not clear how often the links are updated or how accurate they are. Nonetheless, Pingroupie provides a good starting point if you feel completely lost when it comes to finding group boards to join. Did you know that you can search for boards on Pinterest? 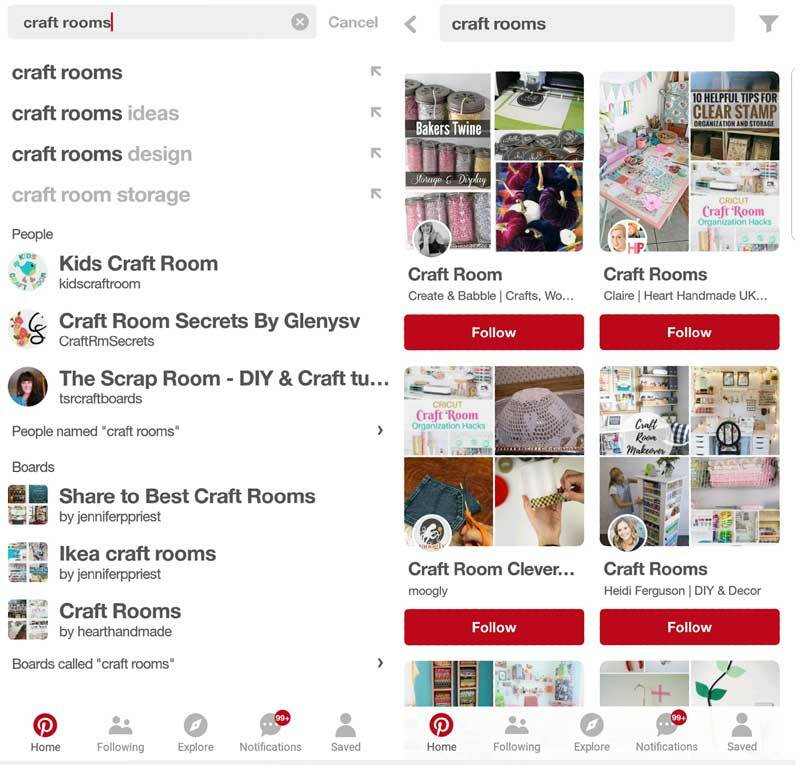 Type the keyword into Pinterest search on the mobile app. Scroll down to the results for Boards. Select the link to see “boards called “craft rooms”“. Scroll through all the boards to find boards to join! You can also see boards come up in the suggested search drop down when you start typing words in Pinterest’s search bar. This is a great way to discover new content from pinners that you never even knew existed . Do you know or follow a lot of other bloggers on Pinterest? Capitalize on the hard work they’ve already done by looking at the group boards of favorite popular bloggers your niche. You can easily identify group boards by the profile icon on the board. Instead of featuring one person, it features a pie graph style profile photo with at least three different images in it. Contact the group board owner to ask to be added to the board. There are Facebook Groups for everything so it’s not surprising that there are Facebook groups specifically for sharing Pinterest group boards. Search for “Pinterest group boards” in Facebook’s search bar to see hundreds of results. In the groups, you can share group boards that you admin and you can also look for group boards to join. So now we’re at the part you came here for *wink wink*: how to loop pins with Tailwind! Easy peasy, right? If you want the spreadsheet, grab the Group Boards Guide first – then you’ll get the option to get the spreadsheet too! Are you using board lists in Tailwind? I’d love to hear more! SAVE this post – hover to PIN IT! I want to use Pinterest Group Boards like a BOSS ... TODAY! SUBSCRIBE to our newsletter + get the BONUS Group Boards Guide in the first email!